The Lower Shavertown Bridge was originally built in Shavertown in 1877 by Anson Jenkins and August Neidig, it is listed on the National Register of Historic Places as of April 29, 1999. It was moved to this location in 1954 by Carl Campbell and was, for a time, called Campbell’s Bridge. 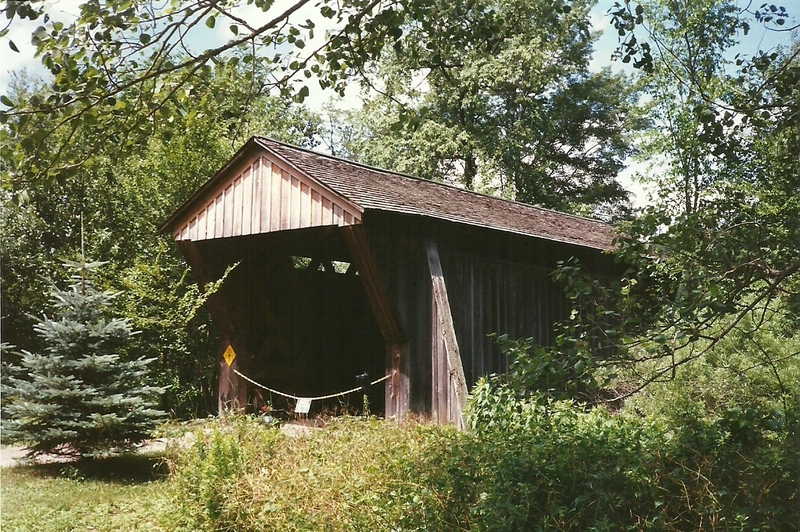 It is located in the Town of Hancock over the Trout Creek with a single span of 32 feet of Town truss design. It is a private bridge, please do not trespass. They usually grant permission to see the bridge if you are polite enough to ask! 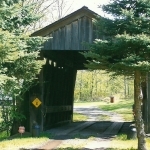 The Lower Shavertown Covered Bridge (once known asthe Campbell Covered Bridge) is one of six covered bridgesstill standing in Delaware County. It is maintained by theowner and carries private traffic across Trout Brook. 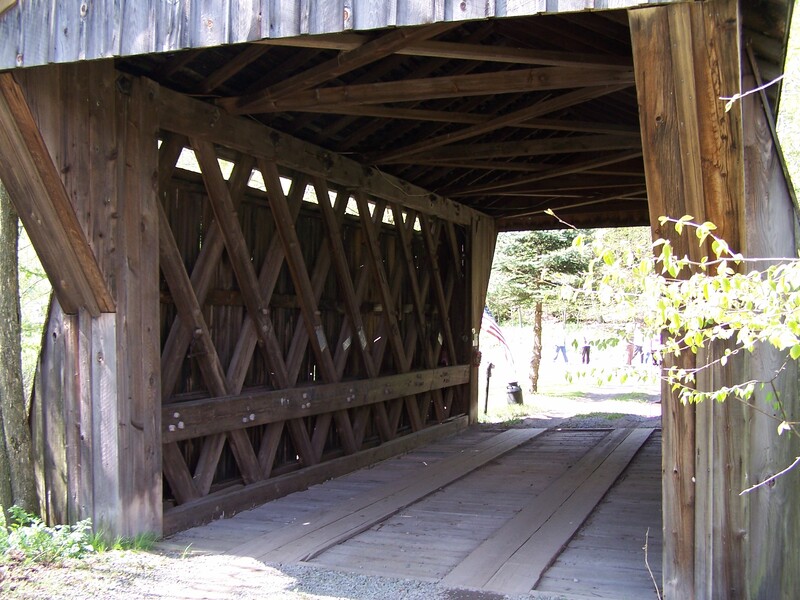 Built by Anson Jenkins and August Neidig in 1877, this 32-foot-long, single span structure incorporates the Town lattice truss design patented on January 28, 1820, and again in 1835 by Ithiel Town of New Haven, Connecticut. 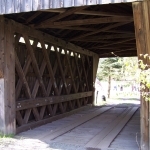 The Lower Shavertown Covered Bridge is very similar in dimensions and design to other bridges in the Catskill region, all of which feature buttresses. The Lower Shavertown has two such buttresses on each side. This little bridge once crossed the mouth of Lower Beech Hill Brook at the southwest perimeter of Shavertown. 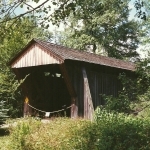 It was originally known as the Methol or Lower Shavertown Covered Bridge. In 1953, when Carl Campbell from Roscoe, NY heard the Pepacton Reservoir was expected to cover this bridge, along with five small towns, he submitted a $1,000 bid for the structure. He thought it would make a perfect entrance to his hunting grounds. Mr. Campbell won the bid and the bridge was moved during the late summer of 1954. On July 10, 2001, there was an unfortunate incident with this bridge. A fully loaded fuel truck, driven by a new driver, broke through the deck of the bridge and rode it down into the creek-bed. Fortunately, no one was hurt. The truck driver suffered a few embarrassing moments, however, after he realized that he apparently missed the instructions on his delivery sheet that noted he should use the alternate bridge located about a mile down the road. Although the truck leaned into the truss, there was no apparent serious damage to it. A large wrecker winched the truck out without any further damage. As a result of the subsequent repairs, the new bridge floor is supported by a pair of steel I-beams with oak planks and running planks on top. 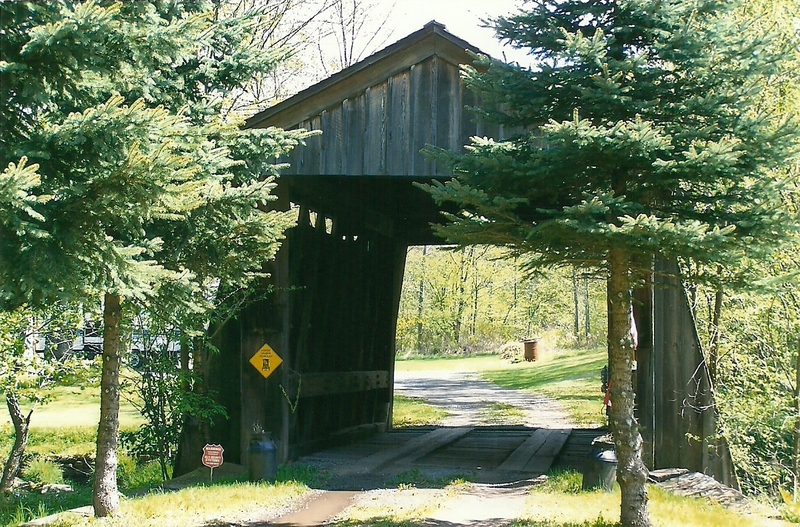 The original Town truss design no longer actually supports this bridge as it was originally designed to do, so it is now classified as a non-functional truss and considered an historic Stringer by the New York State Covered Bridge Society. From Roscoe, take County Route 96 to the north end of Tennanah Lake. Turn right on the road to Lake Muskoday. In 3 miles, on your right, is the bridge.